What is rosacea? Is rosacea contagious? What does rosacea look like? What are causes and risk factors of rosacea? What are rosacea symptoms and signs? Is it possible to prevent rosacea? What tests do health care professionals use to diagnose rosacea? How does rosacea affect the nose and the eyes? What about using acne medicine for rosacea? What types of doctors treat rosacea? What types of medications treat rosacea? What are other treatments for rosacea? What are rosacea triggers? Is there a rosacea diet? What foods are good for rosacea? What natural rosacea treatments or home remedies can help? How should people with rosacea care for their facial skin? What are treatment options for telangiectasias (the red lines)? What are treatment options for rhinophyma (the W.C. Fields nose)? What effect may rosacea have on a person's life? Where can people get more information about rosacea? Rosacea is a common, chronic, incurable, adult acne-like skin condition that is easily controllable and medically manageable. Rosacea commonly affects the central third of the face, especially the nose, and its intensity varies over time. eye problems, such as swollen, red eyelids (blepharitis), conjunctivitis, and rosacea keratitis. Rosacea triggers include alcohol, hot or spicy foods, emotional stress, smoking, and heat. Untreated rosacea tends to worsen over time. Rosacea is considered an incurable auto-inflammatory skin condition that waxes and wanes. As opposed to traditional or teenage acne, most adult patients do not "outgrow" rosacea. Rosacea characteristically involves the central region of the face, mainly the forehead, cheeks, chin, and the lower half of the nose. It commonly appears in people with light skin and particularly in those of English, Irish, and Scottish backgrounds. Some famous people with rosacea include the former U.S. President Bill Clinton and W.C. Fields. Alcohol intake does not directly cause rosacea, but it can be aggravated by it. Rosacea is not contagious or infectious. 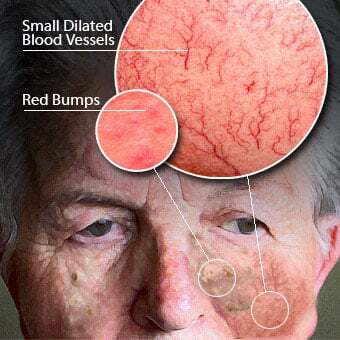 The redness in rosacea, often aggravated by flushing, may cause small blood vessels in the face to enlarge (dilate) permanently and become more visible through the skin, appearing like tiny red lines (called telangiectasias). 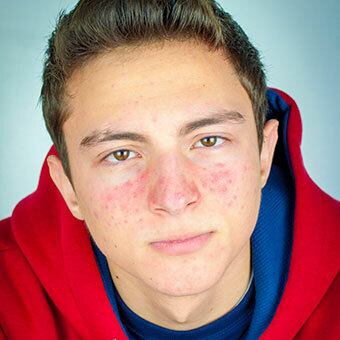 Continual or repeated episodes of flushing and blushing may promote inflammation, causing small red bumps, or papules, that often resemble teenage acne. Acne rosacea and adult acne are other names for rosacea. One of the most unpleasant aspects of rosacea is the overgrowth of dermal tissues producing a "phymatous" change in the skin. This appears as a thickening and permanent swelling of the facial tissues. A bulbous nose called rhinophyma is an example of this change. Rosacea, although distinct from acne, does have some similarities. 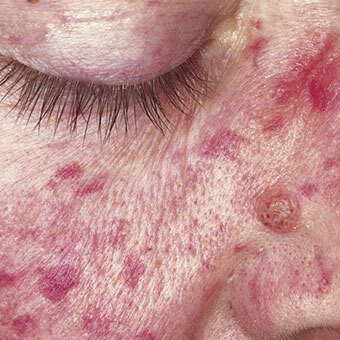 Unlike common acne, rosacea occurs most often in adults (30-50 years of age). Unlike acne vulgaris, rosacea is devoid of blackheads and characteristically does not resolve after puberty. Rosacea strikes both sexes and potentially all ages. It tends to be more frequent in women but more severe in men. It is very uncommon in children, and it is less frequent in people with dark skin. The exact cause of rosacea is still unknown. The basic process seems to involve dilation of the small blood vessels of the face. Currently, health researchers believe that rosacea patients have a genetically mediated reduction in the ability to dampen facial inflammation that is incited by environmental factors such as sunburn, demodicosis (Demodex folliculorum in the hair follicles), flushing, and certain medications. Rosacea tends to affect the "blush" areas of the face and is more common in people who flush easily. Additionally, a variety of triggers is known to cause rosacea to flare. Emotional factors (stress, fear, anxiety, embarrassment, etc.) may trigger blushing and aggravate rosacea. Changes in the weather, like strong winds, or a change in the humidity can cause a flare-up. Sun exposure and sun-damaged skin is associated with rosacea. Exercise, alcohol consumption, smoking, emotional upsets, and spicy food are other well-known triggers that may aggravate rosacea. Many patients may also notice flares around the holidays, particularly Christmas and New Year's holidays. Rosacea risk factors include fair skin, English, Irish, or Scottish heredity, easy blushing, and having other family members with rosacea (called "positive family history"). Additional risk factors include female gender, menopause, and being 30-50 years of age. The symptoms and signs of rosacea tend to come and go. The skin may be clear for weeks, months, or years and then erupt again. Rosacea tends to evolve in stages and typically causes inflammation of the skin of the face, particularly the forehead, cheeks, nose, and chin. When rosacea first develops, it may appear, then disappear, and then reappear. However, the skin may fail to return to its normal color, and the enlarged blood vessels and pimples arrive in time. Rosacea rarely resolves spontaneously. Rosacea generally lasts for years, and if untreated, it gradually tends to worsen. Early in the course of rosacea, facial flushing is transient, lasting for minutes to hours. Later, as the disease progresses, the flushing becomes permanent and the redness does not resolve. It is not possible to prevent rosacea, but it is possible to limit one’s exposure to triggering factors. Once a patient receives a diagnosis of rosacea, it is wise to avoid factors like spicy foods, hot liquids, smoking, and irritating cosmetics that are known to trigger rosacea. Dermatologists are physicians who have special training in the diagnosis of rosacea. Generally, no specific tests are required for the diagnosis of rosacea. Recently, there has been an association noted between rosacea and certain auto-inflammatory diseases, including diabetes, inflammatory bowel disease, and cardiovascular disease. The nose is typically one of the first facial areas affected in rosacea. It can become red and bumpy and develop noticeable dilated small blood vessels. 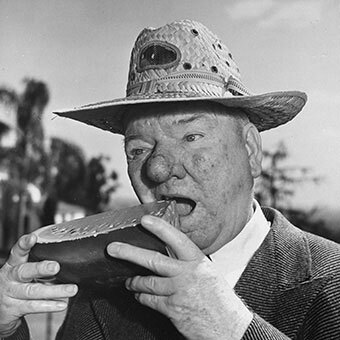 Left untreated, advanced stages of rosacea can cause a disfiguring nose condition called rhinophyma (ryno-fy-ma), literally growth of the nose, characterized by a bulbous, enlarged red nose and puffy cheeks (like the classic comedian W.C. Fields). There may also be thick bumps on the lower half of the nose and the nearby cheek areas. Rhinophyma occurs mainly in men. Severe rhinophyma can require surgical correction and repair. 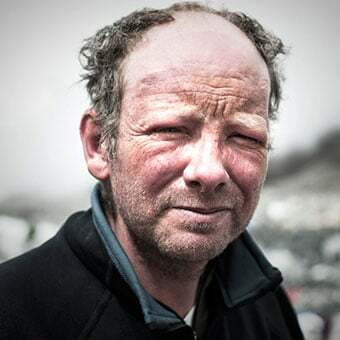 Some people falsely attribute the prominent red nose to excessive alcohol intake, and this stigma can cause embarrassment to those with rosacea. Rosacea may affect the eyes. Not everyone with rosacea has eye problems. A complication of advanced rosacea, known as ocular rosacea, affects the eyes. About half of all people with rosacea report feeling burning, dryness, and irritation of the tissue lining of the eyes (conjunctivitis). These individuals may also experience redness of the eyelids and light sensitivity. Often the eye symptoms may go completely unnoticed and not be a major concern for the individual. Many times, the physician or ophthalmologist may be the first one to notice the eye symptoms. Untreated, ocular rosacea may cause a serious complication that can damage the cornea permanently damaging vision, called rosacea keratitis. 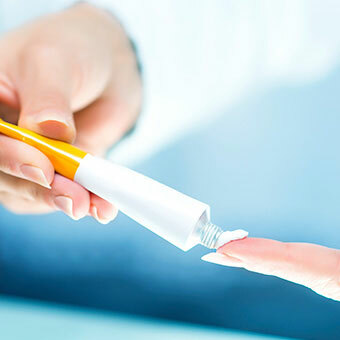 An ophthalmologist can assist in a proper eye evaluation and prescribe rosacea eyedrops. Oral antibiotics may be useful to treat skin and eye rosacea. Since there is some overlap between acne and rosacea, some of the medications may be similar. Acne and rosacea have in common several possible treatments, including (but not limited to) oral antibiotics, topical antibiotics, sulfa-based face washes, isotretinoin, and many others. 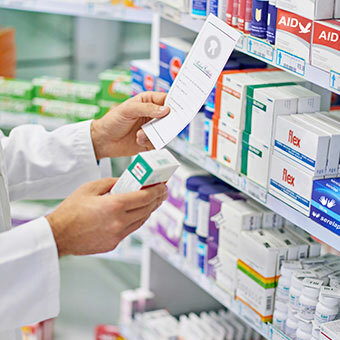 It is important to seek a physician's advice before using random over-the-counter acne medications since they can actually irritate skin that is prone to rosacea. Overall, rosacea skin tends to be more sensitive and easily irritated than that of common acne. Dermatologists are most familiar with which option might be best for each individual. Ophthalmologists treat rosacea-related eye disease. With the proper treatment, patients can control rosacea symptoms and signs. Popular methods of treatment include topical (skin) medications applied by the patient once or twice a day. Topical antibiotic medication such as metronidazole (Metrogel) applied one to two times a day after cleansing may significantly improve rosacea. Azelaic acid (Azelex cream, Finacea gel 15%) is another effective treatment for patients with rosacea. Both metronidazole and azelaic acid work to control the redness and bumps in rosacea. Recently, a new topical prescription gel has become available designed to relieve the redness so characteristic of rosacea. Brimonidine gel (Mirvaso) and oxymetazoline hydrochloride cream (RHOFADE) applied once a day can produce a prolonged period of blanching of previously red skin in rosacea patients. In occasional cases, patients may use short-term topical cortisone (steroid) preparations of minimal strength to reduce local inflammation. Some mild steroids include desonide lotion or hydrocortisone 1% cream applied sparingly once or twice a day just to the irritated areas. There is a risk of causing a rosacea flare by using topical steroids. Prolonged use of topical steroids on the face can also cause irritated skin around the mouth (perioral dermatitis). Some doctors may also suggest tretinoin (Retin-A), tazarotene (Tazorac), or adapalene (Differin), which are medications also used for acne. Rarely, physicians prescribe permethrin (Elimite) cream for rosacea cases that are associated with skin mites. Permethrin also treats follicular Demodex mites if warranted. Doctors infrequently prescribe isotretinoin for severe and resistant rosacea. Often physicians prescribe it after multiple other therapies have been tried for some time and have failed. Patients take a daily capsule of istotretinoin for four to six months. Typically, isotretinoin is most commonly used in the treatment of severe, common acne called acne vulgaris. Close physician monitoring and blood testing are necessary while on isotretinoin. Generally, at least two forms of birth control are required for females using this medication, as pregnancy is absolutely contraindicated while on isotretinoin. 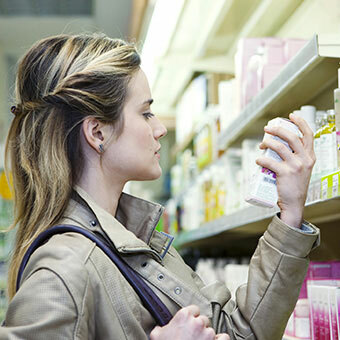 In addition, prescription or over-the-counter sensitive skin cleansers may also provide symptom relief and control. Avoid harsh soaps and lotions. Simple and pure products such as Cetaphil or Purpose gentle skin cleanser may be less irritating. Patients should avoid excessive rubbing or scrubbing the face. benzoyl peroxide washes (for example, Clearasil). 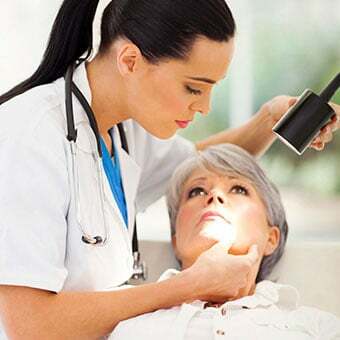 Many patients are now turning to laser and intense light treatments to treat the continual redness and noticeable blood vessels on the face, neck, and chest. 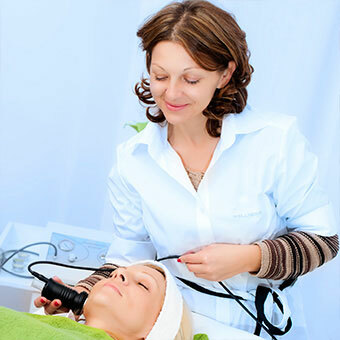 Often considered a safe alternative, laser and intense pulse-light therapy may help improve the skin and complexion. 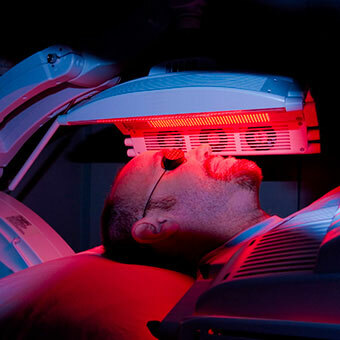 Photodynamic therapy (PDT) is one of the newly available treatments. PDT uses a topical photosensitizer liquid that one applies to the skin and a light to activate the sensitizer. Levulan (aminolevulinic acid) and blue light, commonly used to treat pre-cancers (actinic keratosis) and acne vulgaris, can treat some rosacea patients. The use of PDT in rosacea is off-label, since it is primarily designed for regular acne. PDT works at reducing the inflammation; PDT is performed in a physician's office. The treatment takes anywhere from one to one and a half hours to complete. Strict sun avoidance for approximately one to three days is required after the treatment. Mild discomfort during the treatment and a mild to moderate sunburn appearance after the treatment is common. 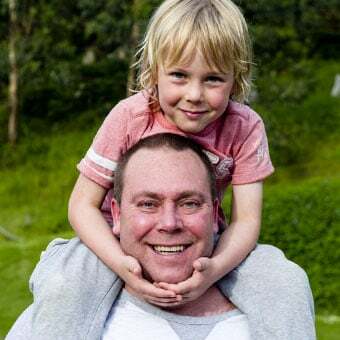 Some patients have experienced remissions (disease-free periods) of several months to years from these types of treatments. Other patients may not notice significant improvement. Glycolic-acid peels may additionally help improve and control rosacea in some people. Professionals can apply chemical peels to patients for approximately two to five minutes every two to four weeks. Mild stinging, itching, or burning may occur and some patients experience peeling for several days after the peel. Any peel can irritate very sensitive skin and cause flares for some people. Peels should be used with caution in rosacea as not everyone is able to tolerate these treatments. While not all rosacea people are the same, there are some common rosacea triggers. Avoiding these potential triggers may also help relieve symptoms and disease flares. It may be helpful to keep a personal diary of foods and other triggers that flare rosacea symptoms. Smoking, spicy foods, hot drinks, and alcohol may cause flushing and should be avoided. Exposure to sunlight and to extreme hot and cold temperatures should be limited as much as possible. Red wine and chocolate are two well-known rosacea triggers. Some listed foods may have no effect on one patient's rosacea but severely affect someone else. Individual reaction patterns vary greatly in rosacea. Therefore, a food diary may help to elucidate one's special triggers. spicy and temperature hot foods. Avoid potent cortisone or steroid medications on the face because they can promote widening of the tiny blood vessels of the face (telangiectasis). 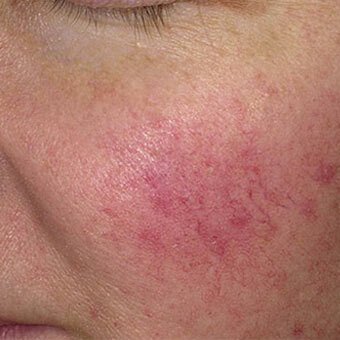 Some patients experience severe rosacea flares after prolonged use of topical steroids. Vasodilator pills can also flare rosacea. Vasodilators include certain blood pressure medications like nitrates, calcium channel blockers (such as nifedipine [Procardia]), and thiazide diuretics (such as Dyazide). Many skin cleansers contain these potential triggers and should be avoided in rosacea. Foods that decrease rosacea flares include less spicy meals, nonalcoholic cool beverages, caffeine-free drinks, nondairy cheese, and thermally cooler meals. Dilute white vinegar facial soaks or cleansing daily or weekly using approximately 1 part regular table vinegar to 6 parts water may be helpful. Vinegar helps as a natural disinfectant and can help decrease the number of yeasts and bacteria on the skin. Since vinegar may flare rosacea in some people, try a small test area before applying to the entire face. 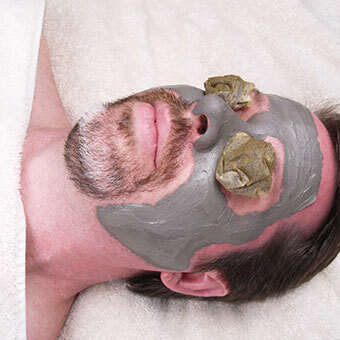 Green tea soaks to the face may also help decrease the redness and inflammation seen in rosacea. Green tea has anti-inflammatory properties. A few commercially available products also use green tea as the active ingredient. Rosacea is an incurable chronic condition. While there is no cure for rosacea, it can be controlled with proper, regular treatment. There are some forms of rosacea that may be significantly cleared for long periods using laser, intense pulse light, photodynamic therapy, or isotretinoin (Accutane). Although still not considered a "cure," some patients experience long-lasting results and may have remissions (disease-free period of time) for months to years. Proper skin care involves using a gentle cleanser to wash the face twice a day. Over-washing may cause irritation. A sunscreen lotion is advisable each morning. A physician may prescribe a topical antibiotic to use once or twice a day under sunscreen. Facial skin care products such as soap, moisturizers, and sunscreens should be free of alcohol or other irritating ingredients. Apply moisturizers very gently after any topical medication has dried. When going outdoors, use sunscreens with an SPF of 50. Source: Interactive Medical Media LLC. Patients can use simple cover-up makeup for the telangiectasias. There are some green-based moisturizers or tinted foundations that may help conceal the redness. Rosacea may affect someone's life minimally, moderately, or severely depending on how active the condition is and one's overall tolerance of the skin symptoms and signs. Some individuals have absolutely no symptoms, and rosacea doesn't bother them. They may enjoy perfectly healthy normal lives without any effect from this benign skin condition. Some patients really like the pink glow to their cheeks and find it gives them a pleasant color without having to use blush. They may not even know they have rosacea. They usually do not want to use any treatment. Patients with moderate rosacea may have periodic flares that require treatment with oral antibiotics, lasers, and other therapies. They may require oral antibiotic therapy for years. Some patients complain of looking like they have been drinking alcohol when in fact they don't drink at all. Although rosacea is not a grave medical situation, severe cases may damage some patient's lives. It is important for these patients to express their concerns with their physician and to get professional help in treating their rosacea. For more information on rosacea, contact the National Rosacea Society (NRS) at http://www.Rosacea.org or 888-no-blush. Support information and research updates may be regularly available from NRS. NRS also sponsors research grants and studies on rosacea treatment. Additional information is available from the American Academy of Dermatology at http://www.AAD.org. Names of U.S. board-certified dermatologists are available on this web site. While online chat groups are available on http://www.Rosacea-Support.org, these should not replace the advice of a physician. Online public posts and comments may not be scientifically or medically accurate, and people with rosacea should evaluate these cautiously. Abokwidir, Manal, and Steven R. Feldman. "Rosacea Management." Skin Appendage Discord 2 (2016): 26-34. Asai, Yuka, et al. "Canadian Clinical Practice Guidelines for Rosacea." Journal of Cutaneous Medicine and Surgery 2016: 1-14. 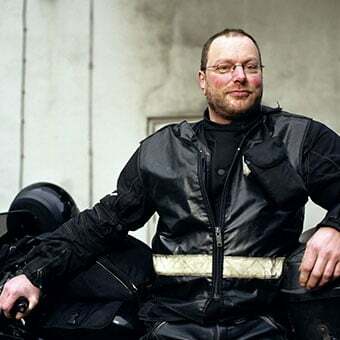 Margalit, Anatte, et al. "The Role of Altered Cutaneous Immune Responses in the Induction and Persistence of Rosacea." Journal of Dermatological Science 82 (2016): 3-8. Steinhoff, Martin, Martin Schmelz, and Jürgen Schauber. "Facial Erythema of Rosacea – Aetiology, Different Pathophysiologies and Treatment Options." Acta Derm Venereol 96 (2016): 579-586. Two, Aimee M., and James Q. Del Rosso. "Kallikrein 5-Medicated Inflammation in Rosacea." The Journal of Clinical Aesthetic Dermatology 7.1 Jan. 2014: 20-25.